What kind of baby food maker are you using? If you have ever prepared food for a baby, you know that it isn’t the easiest of tasks. You need to have the right consistency, ensure it’s well mixed up, and most importantly, make sure that you observe maximum hygiene. However, with everyday utensils, it’s not very easy to achieve this. In fact, they may stand in the way of coming up with the best baby food makers. The easier and more convenient way is by relying on a food maker. It is designed for such operations, is much easier to use, and maintains high standards of hygiene. There are different types in the market. Some will be manual while others are electronic; some are designed for small amounts and other large volumes. The material, design, size, quality, and price also vary. After a close scrutiny of the market, we managed to identify the best baby food makers. Making different types of baby food is easy with this baby food maker. It works with fruits, vegetables, meat, fish, and more. The unit comes with a blender and a steam cooker and has a 3.5 cup capacity. It can be operated using one hand and features a steady base that minimizes unnecessary movement. The graduation marking inside the bowl makes measuring quantities easy whereas the smooth surface improves cleaning and maintenance. Making food for your baby is easier, faster and more hygienic with the BFM-1000 food maker from Cuisinart. The compact unit may book small but it delivers good results and fast. It purees chops, blends, and ad steams food effectively. 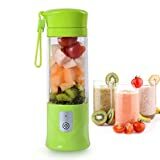 The accessory has a powerful motor for quick blending and precise chopping whereas the patent-pending Blade lock mechanism locals the blade when pouring. This minimizes wastage and improves efficiency. Also included is a bottle warmer, spatula, recipe booklet, measuring cup, and bottle adapter ring. If you want to make baby food the stress-free way then you should consider going for this food maker from Brezza. It combines all the necessary steps including chopping, blending, steaming, and mixing into one. All you do is making the selection and it will do everything else. It is based on a superior technology that ensures the food is blended, chopped, steamed, and mixed properly for the right consistency. Pouring the food from the unit is also easy and convenient thanks to the design. This is one of the most versatile and all-rounded baby foods makers in the market. The 5-in-1 unit comprises of a Steam Cooker, Blender, Defroster, and Warmer. It can prepare any kind of food easily with minimal contact for maximum hygiene. The large capacity can hold lots of food and is perfect for users who want to store for later use. Despite its large capacity, using this accessory is easy and straightforward. It features a user-friendly LCD display and will emit audio alerts for extra convenience. You can prepare all kinds of baby foods with this food maker. It’s suitable for vegetables, fruits, meat, fish, cereals and much more. The accessory features a steam cooker and blender and comes in a one-handed design for easy operation. It also has a sturdy base for minimal movement and improved stability whereas the large cup bowl features graduation marking for easy and quick measurement of food items. When done right, you should have the food ready within 15 minutes. Imagine a food maker that will prepare a whole week’s worth of food in less than 5 minutes? Well, the Magic Bullet Baby Care System does exactly that. 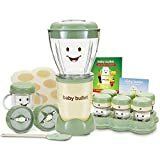 It’s among the fastest baby food makers and is a popular pick for both newbie and experienced users. To perform this fast, it relies on several processes including blending, milling, mixing, popping, and batching. All these processes happen sequentially for efficacy, convenience, and time safely. The accessory comes in a compact design and occupies minimal space, and is made from tough materials to withstand the regular operation. Preparing food for your “Bundle of Joy” will be simple and easy when using this food maker from QOOC. The 4-in-1 accessory will perform the main takes which include steaming, blending, defrosting, and also reheating. It comes in a practical design that allows the user to perform the function using one hand. This is a made possible by the firm and non-slip base that keeps the accessory very stable. It also comes with simple easy-to-reach buttons for improved performance and convenience. To guarantee you and your baby of maximum hygiene and food safety, the food maker doesn’t contain any lead, BPA, phthalate, and is also dishwasher safe. Why struggle to make food for your baby when the Ordego baby food machine can do that for you? 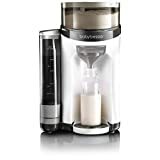 Targeted at moms and dads who want convenience and best hygiene, this accessory features a powerful electric motor that blends and mixes any type of food to produce the right consistency. It has a fairly large capacity to produce several batches and a sturdy base for improved stability. The accessory is made using strong food-grade ABS material and doesn’t contain any BPA, lead, or phthalate. It features heavy-duty construction for resisting wear and tear and smooth easy-to-clean surface. Other than food, it also doubles as a juicer. Preparing food for your baby can be a hard task if you lack the proper tools. You may make food with poor constituency or will be a little solid for a baby. The process of combining different food items may cause a mess, or you may expose the food to germs or bacteria due to inappropriate handling or a lengthy process. 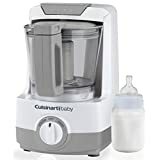 with a good baby food maker, not only will you prepare the meal in a short time but are assured of the right consistency, good quality, and top hygiene. If you desire the best for your baby, then you should think of investing in one of the above products.